A 1918 photograph of members of the Toussaint L’Ouverture chapter of the American Red Cross, Savannah, Georgia. The Toussaint L’Ouverture chapter of the American Red Cross was based in Savannah, Georgia and Chatham County. 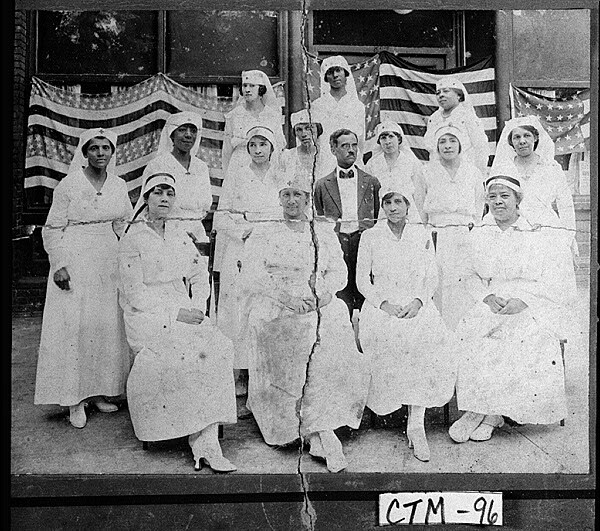 The photograph shows members of this chapter, nurse trainees, and their instructor. Many of the women pictured are African American. The chapter is named Toussaint L’Ouverture, leader of the Haitian Revolution. African American nurses have a long record of wartime and civilian service, including service during the Civil War and Spanish American War. However, people of color continuously encountered discrimination as nurses in both military and civilian organizations. In 1917, when the US entered World War I, the need for nurses was staggering, but the American Red Cross initially refused entry to one thousand African American nurses using the excuse of a lack of segregated housing. Eventually, the War Department consented to authorize African American nurses into the Army Nurse Corps and over 1,800 African American nurses were certified by the American Red Cross to serve during World War I, though fewer ended up serving. “Photograph of members of the Toussant L'Overture Chapter of the American Red Cross, Savannah, Chatham County, Georgia, 1918,” Digital Public Library of America, https://dp.la/item/7354ef1d00cbbf0a19015fe753564879. Courtesy of Georgia Archives via Digital Library of Georgia. A letter by Clara Barton, president of the American Red Cross, to May Wright Sewall, president of the National Council of Women, 1888. An open letter to Clara Barton, president of the American Red Cross, from members of the Club Federico de la Torre, 1897. A 1918 photograph of American Red Cross volunteers preparing surgical dressings. An excerpt from “The American Red Cross: Organization and Activities,” an informational booklet published in 1917. A poster titled “Help Your American Red Cross,” ca. 1918. An American Red Cross fundraising poster, distributed during World War I, ca. 1917. An American Red Cross poster titled “In the Service of Those Who Suffer,” ca. 1919. A bulletin issued by the War Council of the American Red Cross in 1918. A 1919 American Red Cross press release about an award given to African American volunteer Rev. R. H. Windsor. An excerpt from a 1919 report of the New Orleans Chapter of the American Red Cross. A patriotic World War I poster for the American Red Cross, ca. 1920. A 1923 memo from African American activist Walter F. White to W. E. B. Du Bois. A 1979 interview with Susan Hicks about her work with the Red Cross in Charlotte, North Carolina during and after World War I.